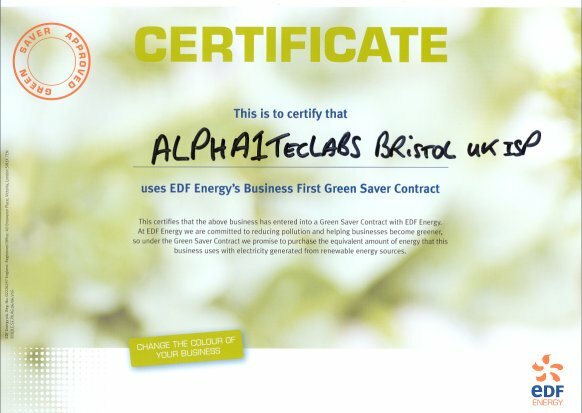 Climate policy statement: We are committed to utilising renewable energy sources, when cost effective and actively pursue policies dedicated to providing a green environmental friendly web hosting Bristol UK ISP company for staff and customers. We are now employing energy conservation reduction developed by ATW Technical Labs. Please click Nominet UK to read terms & conditions before registering .UK domains. We also reserve the right to refuse to release a domain name to another service provider until all fees incurred by the client have been settled. k. Availability of Court Proceedings. The mandatory administrative proceeding requirements set forth in Paragraph 4 shall not prevent either you or the complainant from submitting the dispute to a court of competent jurisdiction for independent resolution before such mandatory administrative proceeding is commenced or after such proceeding is concluded. If an Administrative Panel decides that your domain name registration should be cancelled or transferred, we will wait ten (10) business days (as observed in the location of our principal office) after we are informed by the applicable Provider of the Administrative Panel's decision before implementing that decision. We will then implement the decision unless we have received from you during that ten (10) business day period official documentation (such as a copy of a complaint, file-stamped by the clerk of the court) that you have commenced a lawsuit against the complainant in a jurisdiction to which the complainant has submitted under Paragraph 3(b)(xiii) of the Rules of Procedure. (In general, that jurisdiction is either the location of our principal office or of your address as shown in our Whois database. See Paragraphs 1 and 3(b)(xiii) of the Rules of Procedure for details.) If we receive such documentation within the ten (10) business day period, we will not implement the Administrative Panel's decision, and we will take no further action, until we receive (i) evidence satisfactory to us of a resolution between the parties; (ii) evidence satisfactory to us that your lawsuit has been dismissed or withdrawn; or (iii) a copy of an order from such court dismissing your lawsuit or ordering that you do not have the right to continue to use your domain name. Our site collects information in several ways. When you order information, registrations and services from us you are required to complete a client order form. Alpha1TecLabs requests your name, e-mail address, financial information (such as payment details and credit card details) and your contact information ("Customer Information") together with any information required by Registry Administrators such as the contact details of a technical contact and billing contact of the registrant of a domain name ("Contact Details"). As part of our service, Alpha1TecLabs site visitors users agree implied consent sites may use session cookies to help identify you and access your account data, and your shopping cart, to process the items in your shopping cart, for system administration. A cookie is a small amount of data that is sent to your browser from a web server and is stored on your computer's hard drive. We do not use tracking cookies or web trackers or Google Analytics or sell data to third parties, to ensure protection of your privacy at all times. Our site's registration form requires users to give us contact information (like their name and email address) and financial information (like their account or credit card numbers). Contact information from the order form is used to send orders to our clients, and is also used to get in touch with them when necessary. You should note that the Contact Details you have provided, together with any Customer Information required by the relevant Registry Administrator's, will be - to the extent this is required by Registry Administrator - made publicly available in the Alpha1TecLabs and the relevant Registries WHOIS database in respect of the registrations that you have requested as required by the relevant Registry Administrator's. Alpha1TecLabs verifies the credit card information given by you through a 3rd party clearing company. This clearing company is solely a link in the distribution chain, and do not store, retain, or in any other way use the information they obtain from us. We disclose Contact Information to Registry Administrators together with any other information requested by such Registry Administrators in relation to the registrations requested by you. Alpha1TecLabs may also disclose Customer Information in special cases where Alpha1TecLabs has reason to believe that disclosing this information is necessary to identify, contact or bring legal action against someone who may be violating our terms and conditions of use or may be causing injury or interference with our rights, property, our customers or anyone who could be harmed by such activities. We may also disclose Customer Information when we believe, in good faith, that the law requires it and for administrative and other purposes necessary to maintain services and improve our products and services. This site has security measures in place to protect against the loss, misuse and alteration of the information under our control. Password must be entered to log in to your account and in order to manage your domain name's. We use SSL secure server with digital certificates and all personal information is fully encrypted during all transactions. Please note, however, that no data transmission over the Internet is completely secure. As a result, while we endeavour to protect your personal information, we cannot ensure or warrant the security of any information you provide to us and you transmit such information to us at your own risk. Once we receive your transmission we endeavour to ensure the security of your personal information on our systems. Please note that Alpha1TecLabs.com will never ask for any personal information via email. If you wish to correct, update or otherwise modify the information that you have provided to us please use the privacy email link privacy@alpha1teclabs.com to correct, update or modify the relevant information. If you have any questions about this privacy statement, complaints, any issues, practices of this site or dealings with this Web site, please e-mail support@Alpha1TecLabs.com. Customers are required to commit to a minimum service period of 12 months. Notice of your right of cancellation of contract one months notice required minimum, prior to renewal of next period. In order to use our services you must have a registered domain name with us. Delivery: Once payment has been received transaction will be completed within 24hrs. a) Domain names and web services are non refundable, the customer's order constitutes an offer to buy the goods and services in question. b) The purchase contract is concluded at the point at which you send an acceptance/confirmatory e-mail/fax or letter. c) Alpha1TecLab's reserves the right not to fulfil or to cancel orders in the event of obvious inaccuracies in prices. d) No user shall consume more than their fair share of system resources. e) Domain names and web services must not be used in any illegal activities including phishing purposes or similar criminal activity. Such use can result in termination of your service and forfeit of your domain name and web services. f) To terminate your service and transfer your domain name to a new domain name registrar, there is an administration fee of £10 per domain name to process and assist with each transfer. g) You must provide at least one months notice prior to your service expiry date of your intention to cancel/terminate your services. If your services have expired due to non payment renewal request date sent or you provided notice of termination after requested payment request sent date and made no payment in your expiry period extension then this will result in immediate suspension of your current services until any further outstanding service payments have been received. h) In order to use our ISP services you must use us as your registry provider, use of any other provider will cause your services to cease. Please Note: All services are provided on the basis that they are business to business and that the Consumer Protection (Distance Selling) Regulations 2000 do not apply. Payment methods accepted: Monthly, Quarterly, Yearly by credit or debit card via PayPal, Nochex, or cheque (UK). Payments from outside the UK must be made by credit or debit card in pounds sterling only. We cannot accept any cheques drawn on non-UK banks because of the excessive clearance costs. 1.1 All materials (including, without limitation, all designs, text, graphics and their selection and arrangement) on this Website are the copyright of Alpha1TecLabs Communications plc ("Alpha1TecLabs") or its content providers. No material on this Website may be copied or reproduced in any form whatsoever, whether physical, electronic or otherwise, without Alpha1TecLabs's express, prior, written consent. 1.2 All brand names, product names and/or service names used in this Website are trademarks, trade names, service marks or copyrights of their respective holders. Any use of any such brand name, product name and/or service name without the express, prior, written consent of the relevant rights holder may constitute an infringement of that rights holder's rights and Alpha1TecLabs gives no permission for the use of any such item in any way whatsoever. 2.1 Alpha1TecLabs has taken all reasonable steps in the preparation and delivery of the content on this Website. However, Alpha1TecLabs cannot guarantee the accuracy of any information contained on this Website and, accordingly, you should not rely or act upon any such information until you have independently verified its accuracy and validity. 2.2 Alpha1TecLabs cannot guarantee uninterrupted and/or reliable access to this Website and Alpha1TecLabs makes no guarantees whatsoever as to its operation, availability, functionality or otherwise. 2.3 To the extent permitted by applicable law, Alpha1TecLabs hereby disclaims any and all warranties, whether express or implied, statutory or otherwise as to the accuracy of any information contained on this Website and/or the availability of this Website and, accordingly, Alpha1TecLabs shall have no liability (save in relation to death or injury arising through its negligence) for any loss or damage howsoever arising and of whatever nature incurred in the use of this Website or reliance on any information contained on it including, without limitation, any direct, indirect or consequential loss, loss of business, loss of goodwill or loss of profits. 2.4 This Website may be connected by means of hypertext links to or from other Websites which are not under the control of Alpha1TecLabs. Alpha1TecLabs accepts no responsibility or liability for any of the material contained on any such Website and, while it does not wish to affect the opinion of anybody accessing any such Website whether from this Website or otherwise, Alpha1TecLabs does not endorse, support or promote any statements made or opinions expressed thereon. 2.5 Should you wish to enter into any contract or arrangement (whether formal or informal) with any advertiser on this Website, any such contract or arrangement shall be between you and the relevant advertiser and Alpha1TecLabs shall not be a party to any such contract or arrangement nor become involved in any such contract or arrangement for any reason whatsoever. The terms and conditions (including, without limitation, those relating to payment, delivery, quality and/or any representations or warranties) of any such contract or arrangement are a matter for you and the relevant advertiser to agree and Alpha1TecLabs accepts no responsibility in relation thereto. 2.6 These terms and conditions shall be governed by and construed in accordance with English Law and any dispute arising there from shall be subject to the non-exclusive jurisdiction of the Courts of England. Notwithstanding the foregoing, should this Website be accessed by anyone outside of the United Kingdom, it shall be that person's responsibility to ensure compliance with any locals laws to the extent that they do or may apply. 2.8 Alpha1TecLabs expressly reserves the right to alter these terms and conditions from time to time by posting new terms and conditions on this Website. You understand that all information, data, text, software, music, sound, photographs, graphics, video, messages or other materials ("Content"), whether publicly posted or privately transmitted, are the sole responsibility of the person from which such Content originated. This means that you, and not Alpha1TecLabs, are entirely responsible for all Content that you upload, post or otherwise transmit via the Service. Alpha1TecLabs does not control the Content posted via the Service and, as such, does not guarantee the accuracy, integrity or quality of such Content. You understand that by using the Service, you may be exposed to Content that is offensive, indecent or objectionable. Sending unsolicited mass or commercial e-mail ("spamming") for any purpose whatsoever. Having third parties send out commercial emails on any user's behalf .Using Alpha1TecLabs facilities to receive replies from unsolicited emails (commonly referred to as "drop-box" accounts). Mass or commercial email may be sent only to recipients who have expressly requested receipt of such e-mails, by the sending of an email request to the person performing the mass or commercial mailings. This exchanging of requests, acknowledgements, and final confirmations (commonly referred to as a "double opt-in" process) must be adhered to in their entirety for any mass or commercial email to be considered "solicited" by Alpha1TecLabs. Users that send mass or commercial e-mail are required to maintain complete and accurate records of all e-mail subscription requests, specifically including the email and associated headers sent by every subscriber, and to immediately provide Alpha1TecLabs with such records upon request of Alpha1TecLabs. Subscriptions that do not have a specific recipient generated email request associated with them are invalid, and are strictly prohibited. In the absence of positive, verifiable proof to the contrary, Alpha1TecLabs considers complaints by recipients of e-mails to be de-facto proof that the recipient did not subscribe or otherwise request the e-mail's about which a complaint was generated. Alpha1TecLabs does not claim ownership of the Content you place on your Alpha1TecLabs Site. By submitting Content to Alpha1TecLabs for inclusion on your Alpha1TecLabs Site, you grant Alpha1TecLabs the world-wide, royalty-free, and non-exclusive license to reproduce, modify, adapt and publish the Content solely for the purpose of displaying, distributing and promoting your Alpha1TecLabs Site on Alpha1TecLabs's Internet properties. This license exists only for as long as you continue to be a Alpha1TecLabs user and shall be terminated at the time your Alpha1TecLabs Site is terminated. You acknowledge that Alpha1TecLabs does not pre-screen Content, but that Alpha1TecLabs and its designees shall have the right (but not the obligation) in their sole discretion to refuse or remove any Content that is available via the Service. Without limiting the foregoing, Alpha1TecLabs and its designees shall have the right to remove any Content that violates the Legal Statement or is otherwise objectionable. You agree that you must evaluate, and bear all risks associated with, the use of any Content, including any reliance on the accuracy, completeness, or usefulness of such Content. You agree to indemnify and hold Alpha1TecLabs, and its subsidiaries, affiliates, officers, agents, co-branders or other partners, and employees, harmless from any claim or demand, including reasonable attorneys' fees, made by any third party due to or arising out of your Content, your use of the Service, your connection to the Service, your violation of the Legal Statement, or your violation of any rights of another. You acknowledge that Alpha1TecLabs may establish general practices and limits concerning use of the Service. Alpha1TecLabs reserves the right at any time and from time to time to modify or discontinue, temporarily or permanently, the Service (or any part thereof) with or without notice. You agree that Alpha1TecLabs shall not be liable to you or to any third party for any modification, suspension or discontinuance of the Service. You agree that Alpha1TecLabs, in its sole discretion, may terminate your password, Alpha1TecLabs Site, use of the Service or use of any other Alpha1TecLabs service, and remove and discard any Content within the Service, for any reason, including, without limitation, for lack of use or if Alpha1TecLabs believes that you have violated or acted inconsistently with the letter or spirit of the Legal Statement. Alpha1TecLabs may also in its sole discretion and at any time discontinue providing the Service, or any part thereof, with or without notice. You agree that any termination of your access to the Service under any provision of this Legal Statement may be effected without prior notice, and acknowledge and agree that Alpha1TecLabs may immediately deactivate or delete your Alpha1TecLabs Site and all related information and files in your Alpha1TecLabs Site and/or bar any further access to such files or the Service. Further, you agree that Alpha1TecLabs shall not be liable to you or any third-party for any termination of your access to the Service. Alpha1TecLabs runs advertisements and promotions on Alpha1TecLabs Sites. By creating your Alpha1TecLabs Site, you agree that Alpha1TecLabs has the right to run such advertisements and promotions. The manner, mode and extent of advertising by Alpha1TecLabs on your Alpha1TecLabs Site is subject to change. Your correspondence or business dealings with, or participation in promotions of, advertisers found on or through the Service, including payment and delivery of related goods or services, and any other terms, conditions, warranties or representations associated with such dealings, are solely between you and such advertiser. You agree that Alpha1TecLabs shall not be responsible or liable for any loss or damage of any sort incurred as the result of any such dealings or as the result of the presence of such advertisers on the Service. The Service may provide, or third parties may provide, links to other World Wide Web sites or resources. Because Alpha1TecLabs has no control over such sites and resources, you acknowledge and agree that Alpha1TecLabs is not responsible for the availability of such external sites or resources, and does not endorse and is not responsible or liable for any Content, advertising, products, or other materials on or available from such sites or resources. You further acknowledge and agree that Alpha1TecLabs shall not be responsible or liable, directly or indirectly, for any damage or loss caused or alleged to be caused by or in connection with use of or reliance on any such Content, goods or services available on or through any such site or resource. You acknowledge and agree that the Service and any necessary software used in connection with the Service ("Software") contain proprietary and confidential information that is protected by applicable intellectual property and other laws. You further acknowledge and agree that Content contained in sponsor advertisements or information presented to you through the Service or advertisers is protected by copyrights, trademarks, service marks, patents or other proprietary rights and laws. Except as expressly authorized by Alpha1TecLabs or advertisers, you agree not to modify, rent, lease, loan, sell, distribute or create derivative works based on the Service or the Software, in whole or in part. Alpha1TecLabs grants you a personal, non-transferable and non-exclusive right and license to use the object code of its Software on a single computer; provided that you do not (and do not allow any third party to) copy, modify, create a derivative work of, reverse engineer, reverse assemble or otherwise attempt to discover any source code, sell, assign, sublicense, grant a security interest in or otherwise transfer any right in the Software. You agree not to modify the Software in any manner or form, or to use modified versions of the Software, including (without limitation) for the purpose of obtaining unauthorized access to the Service. You agree not to access the Service by any means other than through the interface that is provided by Alpha1TecLabs for use in accessing the Service. (a) YOUR USE OF THE SERVICE IS AT YOUR SOLE RISK. THE SERVICE IS PROVIDED ON AN "AS IS" AND "AS AVAILABLE" BASIS. Alpha1TecLabs EXPRESSLY DISCLAIMS ALL WARRANTIES OF ANY KIND, WHETHER EXPRESS OR IMPLIED, INCLUDING, BUT NOT LIMITED TO THE IMPLIED WARRANTIES OF MERCHANTABILITY, FITNESS FOR A PARTICULAR PURPOSE AND NON-INFRINGEMENT. (b) Alpha1TecLabs MAKES NO WARRANTY THAT (i) THE SERVICE WILL MEET YOUR REQUIREMENTS, (ii) THE SERVICE WILL BE UNINTERRUPTED, TIMELY, SECURE, OR ERROR-FREE, (iii) THE RESULTS THAT MAY BE OBTAINED FROM THE USE OF THE SERVICE WILL BE ACCURATE OR RELIABLE, (iv) THE QUALITY OF ANY PRODUCTS, SERVICES, INFORMATION, OR OTHER MATERIAL PURCHASED OR OBTAINED BY YOU THROUGH THE SERVICE WILL MEET YOUR EXPECTATIONS, AND (V) ANY ERRORS IN THE SOFTWARE WILL BE CORRECTED. (d) NO ADVICE OR INFORMATION, WHETHER ORAL OR WRITTEN, OBTAINED BY YOU FROM Alpha1TecLabs OR THROUGH OR FROM THE SERVICE SHALL CREATE ANY WARRANTY NOT EXPRESSLY STATED IN THE Legal Statement. YOU EXPRESSLY UNDERSTAND AND AGREE THAT Alpha1TecLabs SHALL NOT BE LIABLE FOR ANY DIRECT, INDIRECT, INCIDENTAL, SPECIAL, CONSEQUENTIAL OR EXEMPLARY DAMAGES, INCLUDING BUT NOT LIMITED TO, DAMAGES FOR LOSS OF PROFITS, GOODWILL, USE, DATA OR OTHER INTANGIBLE LOSSES (EVEN IF Alpha1TecLabs HAS BEEN ADVISED OF THE POSSIBILITY OF SUCH DAMAGES), RESULTING FROM: (i) THE USE OR THE INABILITY TO USE THE SERVICE; (ii) THE COST OF PROCUREMENT OF SUBSTITUTE GOODS AND SERVICES RESULTING FROM ANY GOODS, DATA, INFORMATION OR SERVICES PURCHASED OR OBTAINED OR MESSAGES RECEIVED OR TRANSACTIONS ENTERED INTO THROUGH OR FROM THE SERVICE; (iii) UNAUTHORIZED ACCESS TO OR ALTERATION OF YOUR TRANSMISSIONS OR DATA; (iv) STATEMENTS OR CONDUCT OF ANY THIRD PARTY ON THE SERVICE; OR (v) ANY OTHER MATTER RELATING TO THE SERVICE. If you intend to create or join any service, receive or request any news, messages, alerts or other information from the Service concerning companies, stock quotes, investments or securities, please read the above Sections 16 and 17 again. They go doubly for you. In addition, for this type of information particularly, the phrase "Let the investor beware" is apt. The Service is provided for informational purposes only, and no Content included in the Service is intended for trading or investing purposes. Alpha1TecLabs shall not be responsible or liable for the accuracy, usefulness or availability of any information transmitted via the Service, and shall not be responsible or liable for any trading or investment decisions made based on such information. Notices to you may be made via either email or regular mail. The Service may also provide notices of changes to the Legal Statement or other matters by displaying notices or links to notices to you generally on the Service. Alpha1TecLabs respects the intellectual property rights of others and we ask our users to do the same. The Legal Statement constitute the entire agreement between you and Alpha1TecLabs and govern your use of the Service, superseding any prior agreements between you and Alpha1TecLabs (including, but not limited to, any prior versions of the Legal Statement). You also may be subject to additional terms and conditions that may apply when you use affiliate or other Alpha1TecLabs services, third-party content or third-party software. The Legal Statement and the relationship between you and Alpha1TecLabs shall be governed by the laws of the UK without regard to its conflict of law provisions. You and Alpha1TecLabs agree to submit to the personal and exclusive jurisdiction of the courts located within the county of Bristol, UK. The failure of Alpha1TecLabs to exercise or enforce any right or provision of the Legal Statement shall not constitute a waiver of such right or provision. If any provision of the Legal Statement is found by a court of competent jurisdiction to be invalid, the parties nevertheless agree that the court should endeavour to give effect to the parties' intentions as reflected in the provision, and the other provisions of the Legal Statement remain in full force and effect. You agree that regardless of any statute or law to the contrary, any claim or cause of action arising out of or related to use of the Service or the Legal Statement must be filed within one (1) year after such claim or cause of action arose or be forever barred. The section titles in the Legal Statement are for convenience only and have no legal or contractual effect. Please report any violations of the Legal Statement to support@Alpha1TecLabs.com. If you are unsatisfied with the service you have received, and you have not been able to reach a resolution via our support system, you can make a formal complaint by emailing support@Alpha1TecLabs.com including your account information, and detailing the outstanding complaint. We will acknowledge your complaint within 24hrs, an investigation will be carried out into the issues raised and a full response will be provided within 3 working days. Where the issue is particularly complex it may take longer to respond. If this is likely, we will provide information on the action which will be taken and advise when you can expect a full response. Registrants will receive an email 30 days prior to expiry date, requesting renewal of service and online payment. Note: Registrants can arrange for more notice or can renew for longer periods by emailing support@Alpha1TecLabs.com. We validate registrant data, by validating address and contact details against payment bank details and post code data and a valid contact email address. If notified a domain name cannot be validated, we will contact the registrant again to validate and provide proof of registrant data. From May 6th 2014, if any registrant is unable to validate or provide proof of identity, then we will lock invalid domain registrations for 30 days before they are cancelled. This Acceptable Use Policy document, including the following list of Prohibited Activities, is an integral part of your Hosting Agreement with Alpha1TecLabs Bristol UK ISP. If you engage in any of the activities prohibited by this AUP document Alpha1TecLabs Bristol UK ISP may suspend or terminate your account. Alpha1TecLabs Bristol UK ISP's Acceptable Use Policy (the "Policy") for Alpha1TecLabs Bristol UK ISP Services is designed to help protect Alpha1TecLabs Bristol UK ISP, Alpha1TecLabs Bristol UK ISP's customers and the Internet community in general from irresponsible or, in some cases, illegal activities. The Policy is a non-exclusive list of the actions prohibited by Alpha1TecLabs Bristol UK ISP. Alpha1TecLabs Bristol UK ISP reserves the right to modify the Policy at any time. 2. Sending Unsolicited Bulk Email ("UBE", "spam"). The sending of any form of Unsolicited Bulk Email through Alpha1TecLabs Bristol UK ISP's servers is prohibited. Likewise, the sending of UBE from another service provider advertising a web site, email address or utilizing any resource hosted on Alpha1TecLabs Bristol UK ISP's servers, is prohibited. Alpha1TecLabs Bristol UK ISP accounts or services may not be used to solicit customers from, or collect replies to, messages sent from another Internet Service Provider where those messages violate this Policy or that of the other provider. Note: The Privacy and Electronic Communications Regulations 2003 cover the sending of email marketing. This legislation says that organisations must only send marketing emails to individuals if you have agreed to receive them, except where there is a clearly defined customer relationship. Online businesses that use e-mail marketing must follow all the CAN-SPAM rules. •Identify your message as an advertisement. •Include a valid physical postal address. •Deceptive subject lines and false headers are outlawed. •You will be held responsible if anyone sends emails on your behalf. 3. Running Unconfirmed Mailing Lists. Subscribing email addresses to any mailing list without the express and verifiable permission of the email address owner is prohibited. All mailing lists run by Alpha1TecLabs Bristol UK ISP customers must be Closed-loop ("Confirmed Opt-in"). The subscription confirmation message received from each address owner must be kept on file for the duration of the existence of the mailing list. Purchasing lists of email addresses from 3rd parties for mailing to from any Alpha1TecLabs Bristol UK ISP-hosted domain, or referencing any Alpha1TecLabs Bristol UK ISP account, is prohibited. 8. Unauthorized access, alteration, destruction, or any attempt thereof, of any information of any Alpha1TecLabs Bristol UK ISP customers or end-users by any means or device. 9. Knowingly engage in any activities designed to harass, or that will cause a denial-of-service (e.g., synchronized number sequence attacks) to any other user whether on the Alpha1TecLabs Bristol UK ISP network or on another provider's network. 10. Using Alpha1TecLabs Bristol UK ISP's Services to interfere with the use of the Alpha1TecLabs Bristol UK ISP network by other customers or authorized users. Each Alpha1TecLabs Bristol UK ISP customer is responsible for the activities of its users and, by accepting service from Alpha1TecLabs Bristol UK ISP, is agreeing to ensure that its customers/representatives or end-users abide by this Policy. Complaints about customers/representatives or end-users of an Alpha1TecLabs Bristol UK ISP customer will be forwarded to the Alpha1TecLabs Bristol UK ISP customer's postmaster for action. If violations of the Alpha1TecLabs Bristol UK ISP Acceptable Use Policy occur, Alpha1TecLabs Bristol UK ISP reserves the right to terminate services with or take action to stop the offending customer from violating Alpha1TecLabs Bristol UK ISP's AUP as Alpha1TecLabs Bristol UK ISP deems appropriate, without notice. 1. The amount of storage provided varies between the different services and packages, no user shall consume more than their fair share of system resources. 2. E-mail messages in your mailbox that are kept on the server and are older than 365 days are subject to automatic deletion by the system. If you require longer storage retention please contact sales for an upgrade. 3. E-mail messages in the Spam folder that are kept on the server and are older than 30 days, are subject to automatic deletion by the system. 4. E-mail messages in the Trash folder that are kept on the server and are older than 30 days, are subject to automatic deletion by the system. 5. Our mail servers have an email attachment maximum size limit of 30 megabytes. 6. Our Mail archive facility holds a rolling day archive copy of all your mail kept on the server and archive mail older than 30 days are subject to automatic deletion by the system. 7. There is a default maximum bulk marketing mailbox message send limit of 250 emails per day set on all mailbox accounts, this can be increased on request to support subject to package or cost below. For higher limits please contact sales for a quote. 8. Maximum default storage limit is 1 Gigabyte per email mailbox. If you require greater storage email mailbox capacity please contact sales for an upgrade. We recommend you check your mailbox at least once a week. The Date and Time of the E-mail received will be usually displayed in your "Received" folder. This will help you manage your e-mail and ensure that important ones don't get deleted. When going on vacation or a long trip, use Web Mail service or use the Free E-mail Forwarding facility. Remember to regularly empty your trash folder before you sign-out from the Web Mail. It is also possible to configure this task to be done automatically from within the Web Mail itself. Save your e-mail on your hard disk if they are important and set your mail settings to "Not save messages on Server" if you want to prevent important e-mail from getting deleted.